The front I’d hoped would be pushing Matthew along has become a part of the storm system now. Matthew’s eye has buckled for the most part from what I can see of the satellite photos but still has over 100 mph winds along the coast. It is still moving northward along the coast. I was all but certain it would have turned by now, and apparently so were weather forecasters at the NHC because I heard a bit ago “the Easterly hard right turn didn’t happen”. Ack. I put our dodger and most of the enclosure back up yesterday to help keep rain out of the cockpit, off the instrumentation and off my head. IF I have to take it all down again, it won’t be as difficult this time. I’ve become practiced in the past few days. I did leave the head sail off though because it’s a pain to take up and down if there’s even a tiny breeze. It’s a light, but big sail (about a 130% sail) and it moves us along pretty quickly when it’s up, the wind is to our back or quarter and I let it all out. Currently there are two hurricanes, Matthew which has been downgraded to a category 1 hurricane, and Nicole. Nicole has been meandering around with no clear path or direction yet. But at this moment in time it may follow Matthew into the Bahamas in the north. However, it is almost certain this won’t happen and Bermuda will get the brunt of that hurricane about next Wednesday or Thursday. Charleston is suffering from heavy rain, major flooding in streets. I still don’t see it doing a complete circle. Another front is moving through, look at the first map I posted and you can see it. It will push off tomorrow sometime, from the coast and the hurricane should beat feet to the right. As to curving south again, it’s already high enough into westerlies that I don’t think that is going to happen. Of course, that’s just me. When we made the name of this blog originally, it was “Winds of Change”. Then our first boat became Winds of Change. It’s a line from a Jimmy Buffet Song. And Winds of Time is another line from the same song. This boat was supposed to be called Winds of Time. But she because Adventure. Her lines, and beauty spoke to us, and told us about the Adventures we’d have by calling up on her magic. She has indeed turned out to be a magical Adventure ride for the past year. Adventures, though, are rarely perfect examples of a perfect life, with perfect views, perfect weather, perfect mountain climbs or perfect ocean crossings. In fact, a true adventure is one that places the adventurer out there in the forefront of exposure to weather, wild savages, raging rivers, earthquakes or ocean storms. And our Sailing Ketch Adventure has been nothing less for us. We’ve only lived aboard for a year, with a break because of a break. JoAnne broke her back, so we had to leave. When we returned, Adventure had “calmed down”. She took to sailing like a champ, and I remembered some techniques I had forgotten. For the past few days we’ve watch a massive hurricane grow in the south Caribbean Sea and build up to a Cat 5, then back to a Cat 4. It started a meandering path northward and crossed the tip of a Colombian peninsula, the western tip of Haiti, passed with in 80 nm of Gitmo in Cuba (RIGHT where I said it would go, my exact words on Facebook was 90 nm East of Gitmo) and has proceeded to cross into the Bahamas and turn slightly towards Florida. I have been using a combination of the Euro model and US weather forecast maps, along with a bit other data and a little bit of guestimation based on my years of storm chasing. This is like storm chasing on a giant scale though. It’s not as precise as I’d like to be, but so far it’s working. I started tracking and doing my own work on hurricanes a few years ago because I knew one day I’d be sailing a ship. I want to be SURE. Now… I’m going to say something that might make people mad, so be warned. The National Hurricane Center is great at what they do, but they’ve been WRONG since Katrina. Katrina was a terrible disaster. And they mispredicted it, didn’t warn people properly and later George W. Bush was “blamed” for the hurricane’s damages. Kind of stupid if the forecasters didn’t do it right. And rightly, people who SHOULD KNOW and didn’t give warnings shouldn’t be working in the NHC any more. Today we watch as Matthe is being projected to turn east shortly and head south and east. Back to the Bahamas unfortunately, but, out to sea eventually. Right now, if you take a close look you will see a front moving offshore. It’s been there all along, it’s been moving across the country all along. If they aren’t plugging that data in, they aren’t doing it right. I can’t say what they are doing with the data they are using or how they entered it. But I suspect the NHC isn’t using the right data at all. Why has the EURO model been consistently right, and the NHC has been consistently wrong, and going to extremes to scare the public into being “prepared”? I mean, I agree they should warn the coast, they should tell people to prepare and that’s what FEMA is there to do. But, honestly, they are scaring people across the US Coastline with hurricanes and then at the last minute they are turning off the shore and mostly missing. I don’t get it. I spent yesterday removing all the canvas on the boat. People are screaming to have their boats removed from the water. Panic, chaos, confusion…. No need. So today, and through the weekend I’ll watch more instead of preparing to head south and wait and see. Because the NHC has cried wolf so many times now. Do I trust my own predictions? No, I’m an amateur, but at least my last dozen or so storms I’ve tracked have turned out exactly like I thought. Whether that is lack of confidence in my own work, or the lack of confidence in the NHC now, I’m no longer sure. A prudent sailor won’t head out into a storm like that. And luck is not “found”, it’s created. You don’t put yourself in a position to get your self killed. So, I’ll wait. Against the odds, against the forecasts, and against the models a massive hurricane has formed in the Caribbean Sea. This morning when I checked it had been upgraded to a Category 5. 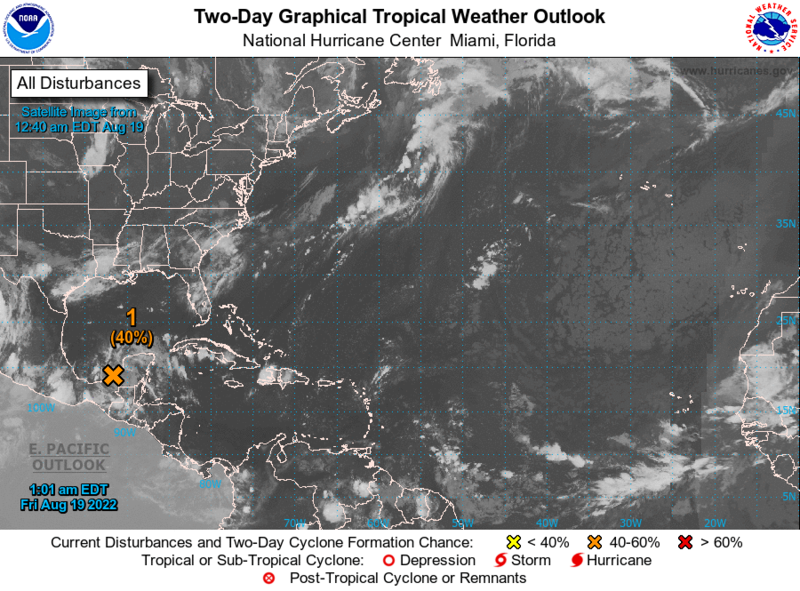 It is sitting in the southern Caribbean Sea, south of Jamaica and appears to have taken a slight left turn, and will probably, quite suddenly swing northward on a collision course with Jamaica, the across Cuba, and onward into the Bahamas. The conditions were really NOT all that conducive for forming such a massive hurricane which is why I said “against predictions” above. But, predictions, humans and computers programmed by humans are fallible. Right now, the various models show the path taking a plunge to the north, through MOST of the Bahamas and on up the coast. Since yesterday evening, that has changed slightly and models are showing it moving north and then pushing eastward. I’ve been watching some fronts moving across the states which might prove to save the day. If the timing is right, and I say IF, the two fronts should converge around Tuesday and push the hurricane east ward. Unfortunately, there is also a pretty big High sitting off the coast and that might cause some problems. I’m not a meteorologist but I’ve studied it enough over the past 40 years to have a bit of knowledge on the subject. JoAnne and I storm chased and spotted for the NWS in Colorado for about 20 years. So we have a bit of background in mesoscale events. This is not meso. This is massive. Synoptic observations and data are easy to get these days, but I’m again, no expert in reading it all. My “take” on this hurricane is that it WILL blow out over the Atlantic after reaching the Bahamas. It will weaken after hitting Jamaica because going over land reduces it’s power. It will build a bit, but hit Cuba further weakening it. By the time it hits Bahamas I think it Cat 3 or even a Cat 2 is all it will be. With LUCK and timing, the fronts should be above it and pushing outward to the East. The Earth’s rotation as it travels north will also cause it to spin out away from the US. And prevailing westerlies. At this point, I HOPE I am right. And I hope that the folks in Bahamas, Cuba and Jamaica all fare better than a category 5 will give them…. In other news, we’ve had rain, rain, rain for the past week. Either in Richmond where we visited a couple of days for my eye check up, and all the way here to the boat. Lots of rain. We had super high water a couple of days ago, washing over C Dock and some of the others. We’re on a floating dock, so the only issue we had was a dinghy full of water because SOMEONE forgot to pull the plug when he hoisted it onto the davits. 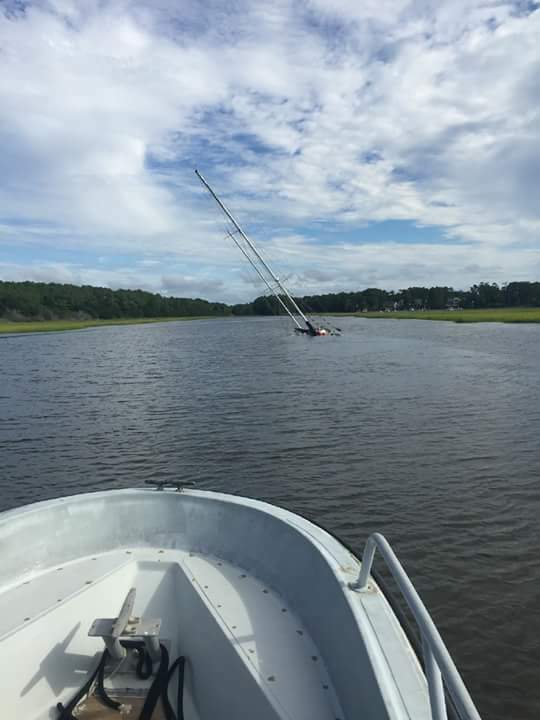 Fortunately a kind neighbor noted something amiss and went over in his dinghy and pulled the plug for me. Normally, I remember to pull it, but for some reason I just spaced it. THAT is the kind of thing that sinks boats. Not remembering the little things. Live and learn. Windows still leak somewhat, here and there. I think I have discovered one of the major leaks though. I believe at this point water from rain is coming in through the traveler area in front of the cockpit. I can’t pull out the stuff due to the building of the boat. I think I can seal it though. As to the windows, I don’t have the right gasket material and not too sure where to get it. So, I thought I’d do an experiment. I cleaned out the old, dried up gasket from one of the portlights and used RTV in the place where a gasket should be. I let it cure and sure enough, it works. Not the best thing, not permanent, but it DOES work in a pinch. So…. I’ll keep a few tubes of that stuff around for emergencies. Front area cleaned up, and I can walk in there, I can access the anchor locker if needed, I can move stuff out of the forward head easily now and we can use that bathroom if necessary too. Hung our walking sticks, and some other long items up front from bungie cords. Tools accessible now. Front name plates are varnished, the red paint is on them, and at some point I can paint in the name of the boat on the forward plates…. maybe it will quit raining for a few days this century…. Plans now include a trip to a military commissary for paper products (TP, paper towels, plastic trash bags to store things) and of course “boat alcohol”. LOL. Cheaper, no taxes, but it’s a long drive. While we still have our car. Our friend Kurt has promised to store our car for this winter/spring coming up until we come back this way. So we have that going for us. I have a radio modification to perform on one of my rigs before we bug out. And I’d like to install the vhf/uhf rig some where in the boat where I can get power to it easily and get an antenna up on top somewhere. Might put that off awhile. Eyes were pronounced “awesome” by the Doctor. I am 20:25 unaided by glasses, but do require reading glasses for up close. Can’t focus that close now. I can free dive soon if I want, or use a mask. So I’m good again, and I can SEE. Wow. Just wow. Basically, all the BIG jobs are done. Just the little stuff. And waiting out hurricanes. I recall at this time last year, we were sitting in Galesville, Maryland awaiting Hurricane Joaquine which was making a bee line up the coast…. and was very similar to this one, except it started further north, went west, and then turned suddenly out to sea and never threatened the coast at all. Almost exactly a year ago today….interesting isn’t it? Fair winds. Catch you on the next update.